This evening my family and I will celebrate the Passover Seder. Our home has been cleaned from top to bottom to remove all traces of chametz (the Hebrew term for "leavened bread"). I have switched all the utensils and pots and pans for ones that we only use during the holiday and have generally used the arrival of Passover as an opportunity to spring clean our home. 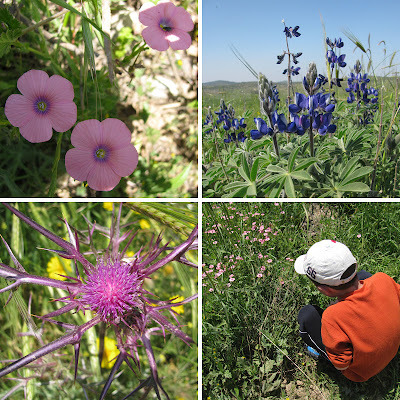 However, in between all this craziness, the youngest son and I took a break and headed to Givat Haturmusim (Lupin Hill) in The Valley of Elah, to see the gorgeous purple Turmusim (Lupins), a few remaining red Calaniot (Anemone), and other wildflowers covering the hill. In early spring (March/April), Israelis from all over the country flock to Givat Haturmusim. 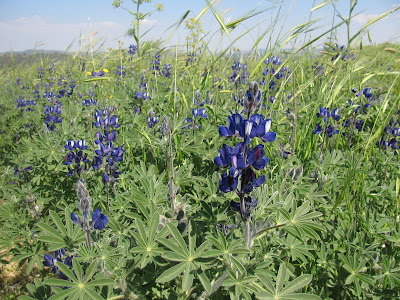 The hill, also known Tel Socho, is famous for its Lupin and is literally covered with this beautiful purple flower. We parked the car and climbed to the top of the hill along the marked trail. The view was incredible and the carpet of flowers quite breathtaking. My son, who had really wanted to spend the day at the Tel Aviv's Luna Park (which was, ahem, fortunately found to be closed that day), declared the place to be "almost as good as the Luna Park!". High praise indeed. 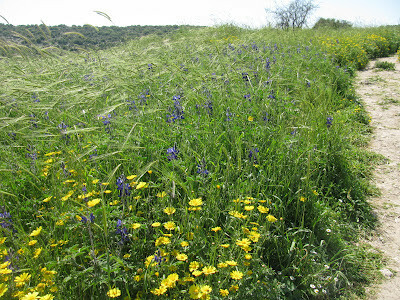 The carpet of colourful flowers gives no hint however to the battle that once occurred on this hill. 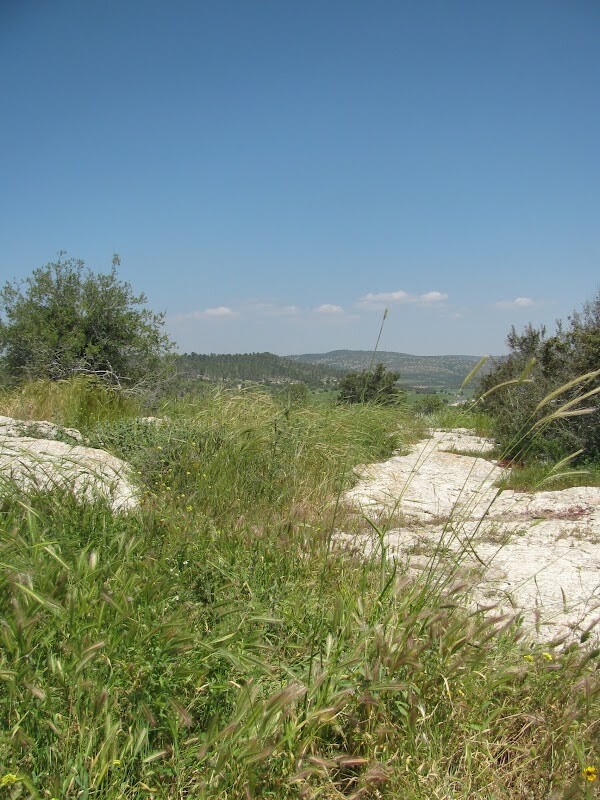 The Valley of Elah (Elah being the Hebrew word for Terebinth – a tree found throughout the valley) is where the battle between David and Goliath took place. Tel Socho was the camping grounds for Goliath and the Philistines. Goliath stood in the Valley of Elah for forty consecutive days, challenging someone to fight him. Of course we all know what happened next. 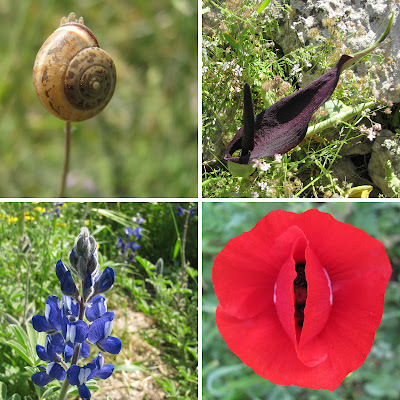 But while David slew Goliath with stones, it is the flowers which now draw people - and especially my son and I, in need of a break from organising and cleaning - to the area. There is a popular Hebrew song sung by many Israeli children at this time of the year. Simcha raba, Simcha raba, Aviv hegiah, Pesach ba. "Great joy, great joy, Spring is here, Pesach is coming" they sing. Well, we certainly saw that Spring is here when we visited Givat Haturmusim. May the sun keep shining and the flowers keep blooming. 'Chag Pesach Sameach', a happy Passover festival, to all celebrating. Beautiful - and you found it, too! We got totally lost looking for it last week (turns out we zigged where we should have zagged) but ended up doing a beautiful walk by (the seriously cool) Hirbat Hnut instead. I'll have to show my mother your photos so she sees what she missed LOL. Lisa, thanks for your visual tour and educating we who are without a religion. I love wildflowers. 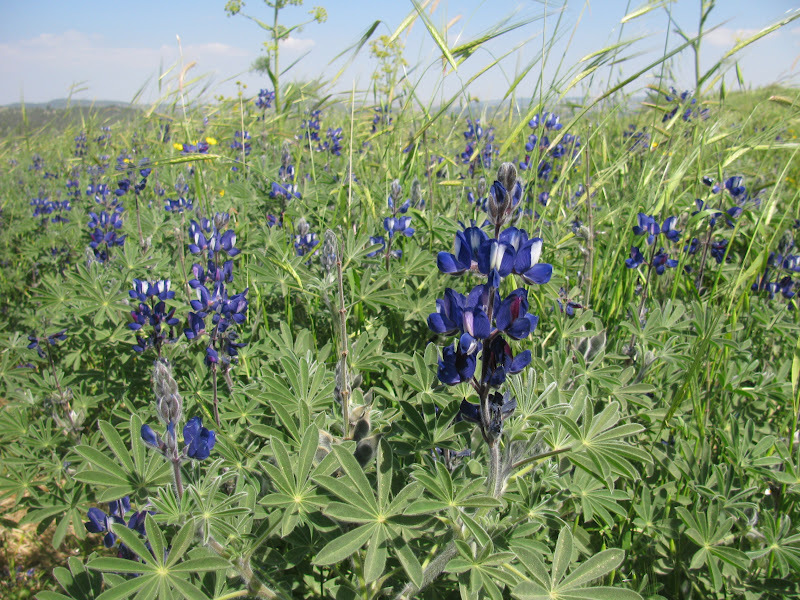 That reminds me that I planted some beautiful blue lupine plants years ago, then they died off after a few years. Looks like a wonderful afternoon with beautiful flowers. I hope you and your family had a wonderful holiday! So many beautiful photos! What a charming place for a springtime walk. Hope all is well and happy weekend! !